Don’t use Windex and a paper towel. You hardly think about it, but the screen on your TV, tablet, and computer is a fairly sensitive thing. The biggest mistake you can make is letting water or anything really wet get close to it. Alcohol isn’t much better. What you really want is something like this Vivanco screen cleaning system. 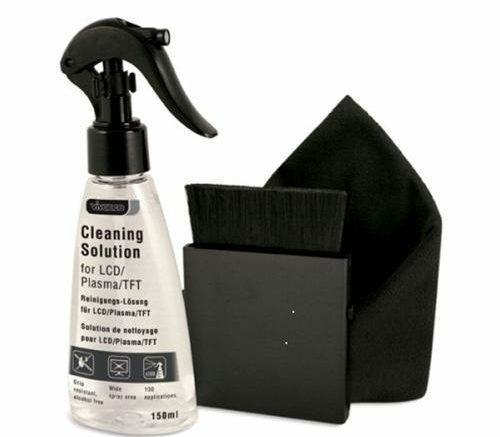 It’s reasonably priced and it’s the right tool for cleaning any screen of any size. Start by brushing off surface dust with the included brush, then spray a fine mist of screen cleaning solution onto the screen, If it’s a large screen, do it in quadrants so the solution doesn’t dry too fast. Use the included microfiber cloth to gently wipe away fingerprints and grime. While smartphones and tablets are meant to be touched, TVs and laptop screens aren’t and you need to be extremely careful. It’s actually best to have the device on and running when you’re cleaning it because if you start to deform the screen surface at all you’ll see it. Remember, just use the tiniest bit of cleaning solution to avoid getting it where you don’t want it. If not everything comes off the first time, try again a second time. For smaller screens that are designed to be touched, you can also try these disposable lens wipes that come pre-moistened and are great for wiping away fingerprints and that goo that comes from your face when you hold the phone against it.